Edward Theuns takes the final stage. The race: Here's the story from stage winner Edward Theuns' Trek-Segafredo team. Edward Theuns ended his final race with Trek-Segafredo with a victory at the Presidential Tour of Turkey stage six Sunday, finally breaking through the stranglehold Sam Bennett (Bora-hansgrohe) has had on the bunched finishes. The 144-kilometer final stage ended in an uphill battle where Theuns finally got the better of Bennett in a tricky, technical final kilometer after the Irish sprinter dove into the last corner with high-speed and crashed. Theuns avoided going down as well, recovered, and sprinted to the win. Theuns explained: "We had a good gap, and it was nice from Sam Bennett that he wanted to take a pull also. Then he passed in the last corner, inside, and I felt he was going really too fast. He crashed right in front of me, I had to brake full, get out of my pedal, get into my pedal again, but then I could go to (Matteo) Pelucchi's wheel and get the slipstream, and I had really a lot of power left in my legs." After Greg Daniel put in more than a day's worth of work to help control the four-man breakaway, the rest of the Trek-Segafredo team went to work to place Theuns into the top positions heading into the climb to the line. Sensing an opportunity, Theuns jumped at the bottom with some 1500 meters to go - the steepest part of the climb - and opened a gap with Bennett and his Bora-hansgrohe teammate Matteo Pelucchi. The three continued to push the pace, with Bennett taking a generous pull before Pelucchi was able to come around to begin a final leadout. Theuns grabbed Pelucchi's wheel with Bennett tucked in third place. Disaster struck for Bennett when he tried to sneak on the inside of Theuns through the corner with 300 meters remaining, taking an aggressive angle and high-speed into the apex and losing grip on the cobbled road. Theuns somehow evaded a falling Bennett and easily overtook Pelucchi in the final meters for the win. "I expected the last climb to be a little bit harder," Theuns continued. "The team did a super great job like they have done all week. They put me right at the front [ahead of the climb]. I had a talk with David Hunter (@Cyclingmole) on Twitter, and he said if you are a legend you go from the bottom," he laughed. "So I was repeating this in my head the whole day, and I saw the moment when we turned on [to the climb] and (Diego) Ulissi was doubting, and I said 'okay, let's go full from the bottom.'" "It was okay the whole week, I knew Bennett was faster in the sprint, but after yesterday when we made a mistake in the finale 200 meters, I was super, super disappointed. So actually, yesterday evening and this morning I wasn't the most pleasant guy to be with. But now this has changed, and I really have to thank the team a lot, and we can have a good party tonight." It was Edward Theuns' final race with the American pinstriped team. He joined Trek-Segafredo two years ago, his first time racing in the WorldTour, and he gave the team the best possible farewell today - a class act from a classy rider. "I am super happy it's my last day riding for Trek-Segafredo, and I am really thankful of the opportunities I have gotten from the team," added Theuns. "I had a hard period after my crash in the Tour (de France) last year, and they always supported me, and I came back, I think, to a higher level. I think there's no better way to thank the team than with a victory like this." Although Theuns won all the applause, Jarlinson Pantano snuck in with a fourth-place finish and leaped into eighth in the GC to cap off a successful final day for Trek-Segafredo. Trek-Segafredo's hard work all week had finally reaped the benefits: the team ended the Tour of Turkey with a win, three riders in the top 20 in the overall classification, and the green points jersey. 2 Pelucchi, Matteo Bora-hansgrohe s.t. 3 Gavazzi, Francesco Androni-Sidermec s.t. 4 Pantano, Jarlinson Trek-Segafredo s.t. 5 Ballerini, Davide Androni-Sidermec s.t. 6 Ulissi, Diego UAE Team Emirates s.t. 7 Minali, Riccardo Astana s.t. 8 Albanese, Vincenzo Bardiani-CSF s.t. 9 Belletti, Manuel Wilier Triestina-Selle Italia s.t. 10 Consonni, Simone UAE Team Emirates s.t. 11 Boev, Igor Gazprom-RusVelo s.t. 12 Hansen, Jesper Astana s.t. 13 Paluta, Michał CCC Sprandi Polkowice s.t. 14 Reijnen, Kiel Trek-Segafredo s.t. 15 Prades, Eduard Caja Rural-Seguros RGA s.t. 16 Martínez, Daniel Wilier Triestina-Selle Italia s.t. 17 Masnada, Fausto Androni-Sidermec s.t. 18 Arslanov, Ildar Gazprom-RusVelo s.t. 19 Barbin, Enrico Bardiani-CSF s.t. 20 Örken, Ahmet Turkey s.t. 21 Rubio, Diego Caja Rural-Seguros RGA s.t. 22 Zeits, Andrey Astana s.t. 23 Habeaux, Gregory WB Veranclassic s.t. 24 Koshevoy, Ilia Wilier Triestina-Selle Italia s.t. 25 Taciak, Mateusz CCC Sprandi Polkowice s.t. 26 Spengler, Lukas WB Veranclassic s.t. 27 Saramotins, Aleksejs Bora-hansgrohe s.t. 28 Şamli, Ferit Turkey s.t. 29 Balkan, Onur Turkey s.t. 30 Brożyna, Piotr CCC Sprandi Polkowice s.t. 31 Bakırcı, Nazım Turkey s.t. 32 Balkan, Serkan Turkey s.t. 33 Herklotz, Silvio Bora-hansgrohe s.t. 34 Molina, Antonio Caja Rural-Seguros RGA s.t. 35 Butler, Chris Caja Rural-Seguros RGA s.t. 36 Pluciński, Leszek CCC Sprandi Polkowice s.t. 37 Atapuma, Darwin UAE Team Emirates s.t. 38 Nicácio, Pedro Soul Brasil s.t. 39 Silva, Lincoln Soul Brasil s.t. 40 Godoy, Yonder Wilier Triestina-Selle Italia s.t. 41 Beppu, Fumiyuki Trek-Segafredo s.t. 42 Akdilek, Ahmet Turkey s.t. 43 Firsanov, Sergey Gazprom-RusVelo s.t. 44 Gruzdev, Dmitriy Astana s.t. 45 Frapporti, Mattia Androni-Sidermec s.t. 46 Zardini, Edoardo Bardiani-CSF s.t. 47 Spreafico, Matteo Androni-Sidermec s.t. 48 Celano, Danilo Caja Rural-Seguros RGA s.t. 49 Turrin, Alex Wilier Triestina-Selle Italia s.t. 50 Affonso, Murilo Soul Brasil s.t. 51 Poppel, Boy van Trek-Segafredo s.t. 52 Maestri, Mirco Bardiani-CSF s.t. 53 Lagutin, Sergey Gazprom-RusVelo s.t. 54 Bennett, Sam Bora-hansgrohe s.t. 55 Rovny, Ivan Gazprom-RusVelo s.t. 56 Niemiec, Przemysław UAE Team Emirates s.t. 57 Tonelli, Alessandro Bardiani-CSF s.t. 58 Maronese, Marco Bardiani-CSF s.t. 59 Brutt, Pavel Gazprom-RusVelo s.t. 60 Duquennoy, Jimmy WB Veranclassic s.t. 61 Özgür, Batuhan Turkey s.t. 62 Sisr, František CCC Sprandi Polkowice s.t. 63 Kump, Marko UAE Team Emirates s.t. 64 Benfatto, Marco Androni-Sidermec s.t. 65 Simion, Paolo Bardiani-CSF s.t. 66 Deruette, Thomas WB Veranclassic s.t. 67 Koch, Jonas CCC Sprandi Polkowice s.t. 68 Reis, Rafael Caja Rural-Seguros RGA s.t. 69 Tleubayev, Ruslan Astana s.t. 71 Stosz, Patryk CCC Sprandi Polkowice s.t. 75 Masson, Christophe WB Veranclassic s.t. 76 Arroyo, David Caja Rural-Seguros RGA s.t. 77 Coledan, Marco Trek-Segafredo s.t. 78 Stassen, Julien WB Veranclassic s.t. 80 Vendrame, Andrea Androni-Sidermec s.t. 89 Bertazzo, Liam Wilier Triestina-Selle Italia s.t. 91 Simón, Jordi Soul Brasil s.t. 92 Pinheiro, Roberto Soul Brasil s.t. 93 Trusov, Nikolay Gazprom-RusVelo s.t. 6 Godoy, Yonder Wilier Triestina-Selle Italia s.t. 14 Rubio, Diego Caja Rural-Seguros RGA s.t. Sam Bennett does it again! The penultimate stage was an up and down for BORA – hansgrohe but ended with an amazing stage win for Sam Bennett. Shane Archbold was in the breakaway of the day, which was caught 30km before the finish. Leo König and Michael Schwarzmann were involved in a crash, but managed to get back on the bike without any injuries. 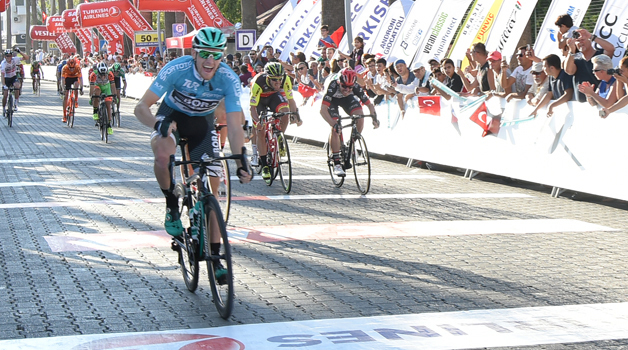 With only one leadout man, Sam Bennett showed his sprinting skills and took his fourth stage win in the Tour of Turkey. 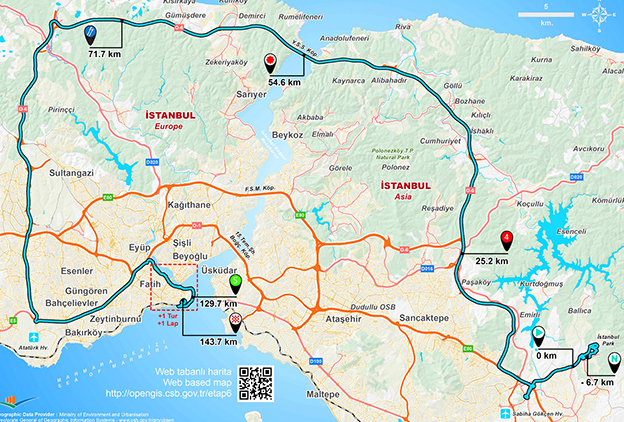 The penultimate stage at the 53rd Presidential Tour of Turkey covered 166km on a demanding course from Selcuk to Izmir. Two KOM´s (second and third category climbs), one intermediate sprint and one beauty sprint awaited the riders. Unfortunately, Gregor got sick overnight, therefore he couldn’t start today. That´s why the tactic changed and forced our riders to make the breakaway, nevertheless Sam Bennett was focused to keep the sprint jersey and take yet another victory. Today´s breakaway included BORA – hansgrohe rider Shane Archbold. Together with four other riders, he went up the road and had more than one-minute gap. His teammates stayed behind while team Trek – Segafredo and Team UAE took control in the main bunch. With 37km remaining the quintet became a trio, but Shane Archbold was still there with an advantage of 45 seconds. At that moment, a crash in the peloton provided both excitement for the viewers and disappointment for the team as Leo König and Michael Schwarzmann were involved but both were able to get back on the bike having managed to avoid any injuries. The reduced main bunch caught the escapees 30km before the finish, suddenly the race came alive. Two groups were built, Sam Bennett and Silvio Herklotz were in the leading group following a gruelling climb, but after some kilometres Alex Saramotins was able to join his teammates. As the race headed into the finale, Sam and Alex formed their sprint train. Sam waited until the final meters and was on the wheels of Alex. As he has already done this week, in the closing metres, Sam broke clear and made it looks easy as he took a convincing win over Edward Theuns of Trek Seagfredo. 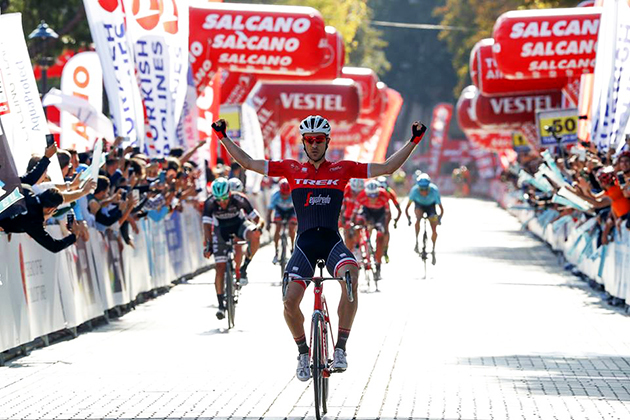 He sprinted to his fourth stage win at this Tour of Turkey and his 10th this season. 2 Örken, Ahmet Turkey s.t. 3 Consonni, Simone UAE Team Emirates s.t. 4 Theuns, Edward Trek-Segafredo s.t. 5 Paluta, Michał CCC Sprandi Polkowice s.t. 6 Minali, Riccardo Astana s.t. 7 Poppel, Boy van Trek-Segafredo s.t. 8 Ballerini, Davide Androni-Sidermec s.t. 9 Gavazzi, Francesco Androni-Sidermec s.t. 10 Habeaux, Gregory WB Veranclassic s.t. 11 Prades, Eduard Caja Rural-Seguros RGA s.t. 12 Simón, Jordi Soul Brasil s.t. 13 Trusov, Nikolay Gazprom-RusVelo s.t. 14 Albanese, Vincenzo Bardiani-CSF s.t. 15 Stosz, Patryk CCC Sprandi Polkowice s.t. 16 Stassen, Julien WB Veranclassic s.t. 17 Belletti, Manuel Wilier Triestina-Selle Italia s.t. 18 Rubio, Diego Caja Rural-Seguros RGA s.t. 19 Ulissi, Diego UAE Team Emirates s.t. 20 Taciak, Mateusz CCC Sprandi Polkowice s.t. 21 Godoy, Yonder Wilier Triestina-Selle Italia s.t. 22 Saramotins, Aleksejs Bora-hansgrohe s.t. 23 Arslanov, Ildar Gazprom-RusVelo s.t. 24 Martínez, Daniel Wilier Triestina-Selle Italia s.t. 25 Firsanov, Sergey Gazprom-RusVelo s.t. 26 Pantano, Jarlinson Trek-Segafredo s.t. 27 Herklotz, Silvio Bora-hansgrohe s.t. 28 Masson, Christophe WB Veranclassic s.t. 29 Molina, Antonio Caja Rural-Seguros RGA s.t. 30 Hansen, Jesper Astana s.t. 31 Zeits, Andrey Astana s.t. 32 Masnada, Fausto Androni-Sidermec s.t. 33 Atapuma, Darwin UAE Team Emirates s.t. 34 Niemiec, Przemysław UAE Team Emirates s.t. 35 Bakırcı, Nazım Turkey s.t. 36 Reijnen, Kiel Trek-Segafredo s.t. 37 Butler, Chris Caja Rural-Seguros RGA s.t. 38 Pluciński, Leszek CCC Sprandi Polkowice s.t. 39 Rovny, Ivan Gazprom-RusVelo s.t. 41 Zardini, Edoardo Bardiani-CSF s.t. 42 Arroyo, David Caja Rural-Seguros RGA s.t. 43 Koshevoy, Ilia Wilier Triestina-Selle Italia s.t. 44 Brożyna, Piotr CCC Sprandi Polkowice s.t. 45 Tonelli, Alessandro Bardiani-CSF s.t. 46 Beppu, Fumiyuki Trek-Segafredo s.t. 48 Maestri, Mirco Bardiani-CSF s.t. 51 Bertazzo, Liam Wilier Triestina-Selle Italia s.t. 54 Laengen, Vegard UAE Team Emirates s.t. 58 Özgür, Batuhan Turkey s.t. 59 Tleubayev, Ruslan Astana s.t. 60 Reis, Rafael Caja Rural-Seguros RGA s.t. 61 Brutt, Pavel Gazprom-RusVelo s.t. 64 Kump, Marko UAE Team Emirates s.t. 66 Silva, Lincoln Soul Brasil s.t. 67 Balkan, Serkan Turkey s.t. 68 Maronese, Marco Bardiani-CSF s.t. 69 Frapporti, Mattia Androni-Sidermec s.t. 70 Duquennoy, Jimmy WB Veranclassic s.t. 71 Małecki, Kamil CCC Sprandi Polkowice s.t. 72 Boev, Igor Gazprom-RusVelo s.t. 73 Sterbini, Simone Bardiani-CSF s.t. 74 Deruette, Thomas WB Veranclassic s.t. 75 Atalay, Muhammed Turkey s.t. 76 Akdilek, Ahmet Turkey s.t. 77 Balkan, Onur Turkey s.t. 78 Cecchin, Alberto Wilier Triestina-Selle Italia s.t. 79 Spreafico, Matteo Androni-Sidermec s.t. 80 Turrin, Alex Wilier Triestina-Selle Italia s.t. 81 Koch, Jonas CCC Sprandi Polkowice s.t. 82 Spengler, Lukas WB Veranclassic s.t. 83 Pelucchi, Matteo Bora-hansgrohe s.t. 84 Sisr, František CCC Sprandi Polkowice s.t. 85 Vendrame, Andrea Androni-Sidermec s.t. 87 Stalnov, Nikita Astana s.t. 88 Zurlo, Federico UAE Team Emirates s.t. 92 König, Leopold Bora-hansgrohe s.t. 93 Schwarzmann, Michael Bora-hansgrohe s.t. 94 Pinheiro, Roberto Soul Brasil s.t. 6 Arslanov, Ildar Gazprom-RusVelo s.t. 12 Koshevoy, Ilia Wilier Triestina-Selle Italia s.t. 17 Atapuma, Darwin UAE Team Emirates s.t. Diego Ulissi takes the solo win. 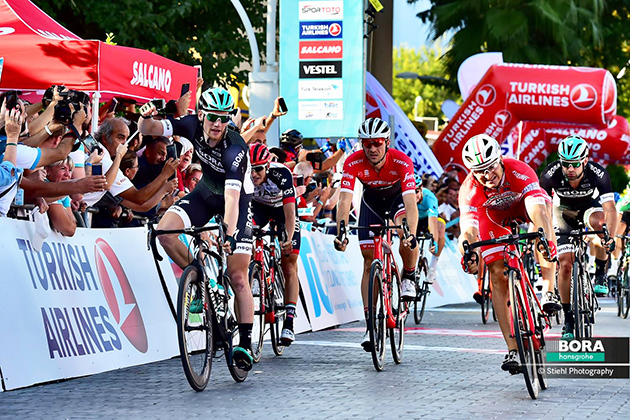 Laengen, Consonni and Niemiec assisted Ulissi as he performed a tour de force for UAE Team Emirates in the 4th and queen stage of the Tour of Turkey, (204.1 km) that took the riders from Marmaris to the uphill arrival in Selcuk. Diego Ulissi clinched the stage as well as the jersey for leader of the race, coming in 5sec ahead of Hansen, 9sec in front of Martinez, and leaving Masnada 11sec behind. The Italian ace did a great job managing the last 2 km of the race, keeping everything under control and then not ceding an inch to the three riders who managed to keep up with him in the head of the race. The entire Emirati formation did a fantastic job, with Laengen keeping up an impressively constant pace along the final climb. Consonni was very efficient in pulling the group on the descents and Niemiec (who was subsequently 9th at the finish line) was relentless in picking off adversaries on the first part of the climb as they headed towards the arrival. In the general classification, Ulissi has a 12sec advantage over Hansen. 8 Mühlberger, Gregor Bora-hansgrohe s.t. 13 Koshevoy, Ilia Wilier Triestina-Selle Italia s.t. 16 Simón, Jordi Soul Brasil s.t. 17 Rubio, Diego Caja Rural-Seguros RGA s.t. 21 Butler, Chris Caja Rural-Seguros RGA s.t. 23 Taciak, Mateusz CCC Sprandi Polkowice s.t. 25 Reijnen, Kiel Trek-Segafredo s.t. 32 Bizhigitov, Zhandos Astana s.t. 34 Saramotins, Aleksejs Bora-hansgrohe s.t. 35 Daniel, Gregory Trek-Segafredo s.t. 53 Reis, Rafael Caja Rural-Seguros RGA s.t. 54 Affonso, Murilo Soul Brasil s.t. 56 Frapporti, Mattia Androni-Sidermec s.t. 60 Trusov, Nikolay Gazprom-RusVelo s.t. 61 Rovny, Ivan Gazprom-RusVelo s.t. 62 Atalay, Muhammed Turkey s.t. 63 Balkan, Onur Turkey s.t. 66 Sisr, František CCC Sprandi Polkowice s.t. 68 Małecki, Kamil CCC Sprandi Polkowice s.t. 71 Alafaci, Eugenio Trek-Segafredo s.t. 72 Duquennoy, Jimmy WB Veranclassic s.t. 73 Boev, Igor Gazprom-RusVelo s.t. 74 Coledan, Marco Trek-Segafredo s.t. 75 Kump, Marko UAE Team Emirates s.t. 77 Simion, Paolo Bardiani-CSF s.t. 78 Minali, Riccardo Astana s.t. 79 Belletti, Manuel Wilier Triestina-Selle Italia s.t. 84 Pinheiro, Roberto Soul Brasil s.t. 86 Silva, Lincoln Soul Brasil s.t. 88 Maronese, Marco Bardiani-CSF s.t. 89 Şamli, Ferit Turkey s.t. 90 Pelucchi, Matteo Bora-hansgrohe s.t. 91 Bertazzo, Liam Wilier Triestina-Selle Italia s.t. 92 Schwarzmann, Michael Bora-hansgrohe s.t. 93 Benfatto, Marco Androni-Sidermec s.t. 94 Özgür, Batuhan Turkey s.t. 96 Archbold, Shane Bora-hansgrohe s.t. 97 Zurlo, Federico UAE Team Emirates s.t. 15 Rubio, Diego Caja Rural-Seguros RGA s.t. 18 Atapuma, Darwin UAE Team Emirates s.t. 29 Brożyna, Piotr CCC Sprandi Polkowice s.t. 31 Pluciński, Leszek CCC Sprandi Polkowice s.t. 60 Deruette, Thomas WB Veranclassic-Aqua Protect s.t. 78 Laengen, Vegard UAE Team Emirates s.t. 90 Özgür, Batuhan Turkey s.t. That makes all three 2017 Tour of Turkey stages for Sam Bennett. 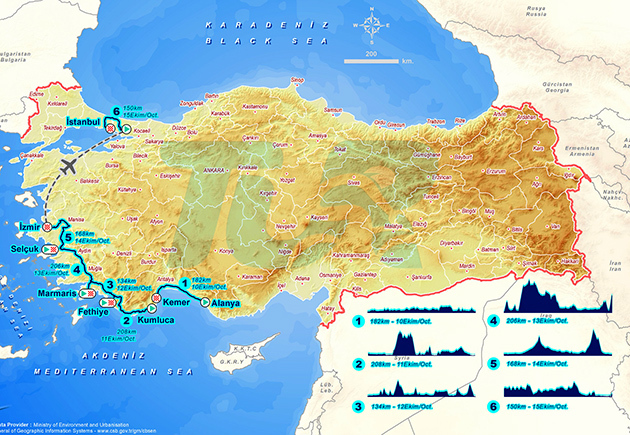 The third stage at the Tour of Turkey was dominated with many attacks on the final kilometres. 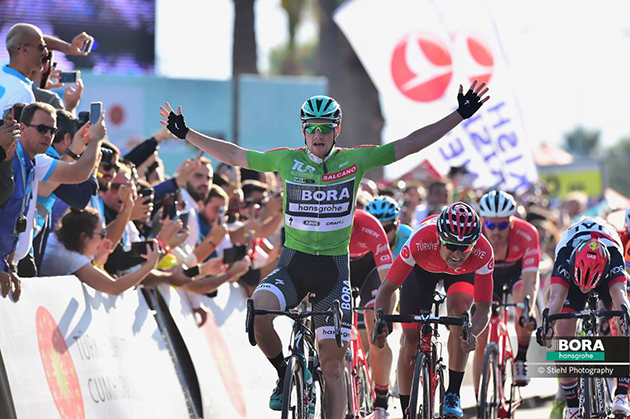 BORA – hansgrohe was able to stay in the first group and headed into the finale, where Sam Bennett flies to his third consecutive stage win in this year´s Tour of Turkey and will be again the man in turquoise on tomorrow´s fourth stage. Today´s stage covered 128.6km from Fethiye to Marmaris on a selective course with a second category climb and one intermediate sprint. BORA – hansgrohe started in this third stage with the leaders jersey and tried once again to defend it, whilst Gregor Mühlberger wanted to go for a good GC result in the upcoming hilly stages. Like yesterday, an early breakaway of three riders distanced themselves clear from the main bunch and built an advantage of more than five minutes. The Peloton took it easy and granted the breakaway. With 41km remaining the trio still had an advantage of more than two minutes. 30km before the finish, the peloton, with BORA – hansgrohe in the front, increased the pace. The breakaway was still in front, with one-minute gap, but with 20km remaining the break was caught. An attack of one rider catered for excitement on the finale kilometres. The whole BORA – hansgrohe team stayed together in the main bunch and tried to catch the soloist. 10km before the finish the race was back together and headed into the finale. Shortly before the finish, the race had to pass a short climb but in the descent the peloton fell apart with BORA – hansgrohe in the first group. The race headed into the city of Marmaris, Sam Bennett was in a good position and his BORA – hansgrohe teammates dominated the remaining bunch. Sam Bennett took the wheel of his teammates and rode to his third consecutive stage win. 2 Theuns, Edward Trek-Segafredo s.t. 4 Belletti, Manuel Wilier Triestina-Selle Italia s.t. 5 Vendrame, Andrea Androni-Sidermec s.t. 6 Gavazzi, Francesco Androni-Sidermec s.t. 7 Albanese, Vincenzo Bardiani-CSF s.t. 8 Prades, Eduard Caja Rural-Seguros RGA s.t. 10 Örken, Ahmet Turkey s.t. 11 Mühlberger, Gregor Bora-hansgrohe s.t. 12 Ulissi, Diego UAE Team Emirates s.t. 14 Barbin, Enrico Bardiani-CSF s.t. 15 Godoy, Yonder Wilier Triestina-Selle Italia s.t. 17 Reis, Rafael Caja Rural-Seguros RGA s.t. 18 Habeaux, Gregory WB Veranclassic s.t. 19 Archbold, Shane Bora-hansgrohe s.t. 20 Zeits, Andrey Astana s.t. 21 Hansen, Jesper Astana s.t. 22 Arslanov, Ildar Gazprom-RusVelo s.t. 23 Maestri, Mirco Bardiani-CSF s.t. 24 Rubio, Diego Caja Rural-Seguros RGA s.t. 26 Martínez, Daniel Wilier Triestina-Selle Italia s.t. 27 Simón, Jordi Soul Brasil s.t. 28 Niemiec, Przemysław UAE Team Emirates s.t. 29 Arroyo, David Caja Rural-Seguros RGA s.t. 30 Bertazzo, Liam Wilier Triestina-Selle Italia s.t. 31 Molina, Antonio Caja Rural-Seguros RGA s.t. 32 Zurlo, Federico UAE Team Emirates s.t. 33 Saramotins, Aleksejs Bora-hansgrohe s.t. 34 Butler, Chris Caja Rural-Seguros RGA s.t. 35 Herklotz, Silvio Bora-hansgrohe s.t. 36 Lagutin, Sergey Gazprom-RusVelo s.t. 37 Tonelli, Alessandro Bardiani-CSF s.t. 38 Masnada, Fausto Androni-Sidermec s.t. 39 Poppel, Boy van Trek-Segafredo s.t. 40 Bizhigitov, Zhandos Astana s.t. 41 Brutt, Pavel Gazprom-RusVelo s.t. 42 Zardini, Edoardo Bardiani-CSF s.t. 44 Paluta, Michał CCC Sprandi Polkowice s.t. 45 Ravasi, Edward UAE Team Emirates s.t. 48 Reijnen, Kiel Trek-Segafredo s.t. 49 Flórez, Miguel Wilier Triestina-Selle Italia s.t. 50 Brożyna, Piotr CCC Sprandi Polkowice s.t. 51 Firsanov, Sergey Gazprom-RusVelo s.t. 56 Minali, Riccardo Astana s.t. 57 Sterbini, Simone Bardiani-CSF s.t. 58 Kump, Marko UAE Team Emirates s.t. 59 Sisr, František CCC Sprandi Polkowice s.t. 60 Bakırcı, Nazım Turkey s.t. 61 Celano, Danilo Caja Rural-Seguros RGA s.t. 62 Masson, Christophe WB Veranclassic s.t. 64 Balkan, Onur Turkey s.t. 65 Boev, Igor Gazprom-RusVelo s.t. 67 Maronese, Marco Bardiani-CSF s.t. 68 Balkan, Serkan Turkey s.t. 69 Akdilek, Ahmet Turkey s.t. 71 Affonso, Murilo Soul Brasil s.t. 79 Duquennoy, Jimmy WB Veranclassic s.t. 80 Małecki, Kamil CCC Sprandi Polkowice s.t. 83 Schwarzmann, Michael Bora-hansgrohe s.t. 85 Silva, Lincoln Soul Brasil s.t. 86 Pelucchi, Matteo Bora-hansgrohe s.t. 87 Deruette, Thomas WB Veranclassic s.t. 88 Alafaci, Eugenio Trek-Segafredo s.t. 89 Pinheiro, Roberto Soul Brasil s.t. 90 Tleubayev, Ruslan Astana s.t. 91 Şamli, Ferit Turkey s.t. 92 Atalay, Muhammed Turkey s.t. 95 Pires, Raphael Soul Brasil s.t. 96 Coledan, Marco Trek-Segafredo s.t. 97 Laengen, Vegard UAE Team Emirates s.t. 99 Ranghetti, Victor Soul Brasil s.t. 5 Ulissi, Diego UAE Team Emirates s.t. 7 Maestri, Mirco Bardiani-CSF s.t. 9 Örken, Ahmet Turkey s.t. 13 Poppel, Boy van Trek-Segafredo s.t. 14 Zeits, Andrey Astana s.t. 15 Mühlberger, Gregor Bora-hansgrohe s.t. 16 Herklotz, Silvio Bora-hansgrohe s.t. 18 Bizhigitov, Zhandos Astana s.t. 19 Reis, Rafael Caja Rural-Seguros RGA s.t. 20 Niemiec, Przemysław UAE Team Emirates s.t. 21 Zardini, Edoardo Bardiani-CSF s.t. 22 Ravasi, Edward UAE Team Emirates s.t. 23 Godoy, Yonder Wilier Triestina-Selle Italia s.t. 24 Arroyo, David Caja Rural-Seguros RGA s.t. 25 Hansen, Jesper Astana s.t. 26 Masnada, Fausto Androni-Sidermec s.t. 27 Arslanov, Ildar Gazprom-RusVelo s.t. 29 Tonelli, Alessandro Bardiani-CSF s.t. 30 Butler, Chris Caja Rural-Seguros RGA s.t. 32 Taciak, Mateusz CCC Sprandi Polkowice s.t. 33 Brutt, Pavel Gazprom-RusVelo s.t. 35 Koch, Jonas CCC Sprandi Polkowice s.t. 36 Zurlo, Federico UAE Team Emirates s.t. 37 Vendrame, Andrea Androni-Sidermec s.t. 38 Habeaux, Gregory WB Veranclassic s.t. 39 Flórez, Miguel Wilier Triestina-Selle Italia s.t. 40 Paluta, Michał CCC Sprandi Polkowice s.t. 41 Martínez, Daniel Wilier Triestina-Selle Italia s.t. 42 Lagutin, Sergey Gazprom-RusVelo s.t. 43 Atapuma, Darwin UAE Team Emirates s.t. 44 Firsanov, Sergey Gazprom-RusVelo s.t. 45 Koshevoy, Ilia Wilier Triestina-Selle Italia s.t. 46 Pluciński, Leszek CCC Sprandi Polkowice s.t. 49 Brożyna, Piotr CCC Sprandi Polkowice s.t. 53 Bakırcı, Nazım Turkey s.t. 54 Celano, Danilo Caja Rural-Seguros RGA s.t. 55 Masson, Christophe WB Veranclassic s.t. 62 Balkan, Serkan Turkey s.t. 63 Akdilek, Ahmet Turkey s.t. 68 Kump, Marko UAE Team Emirates s.t. 85 Özgür, Batuhan Turkey s.t. 86 Laengen, Vegard UAE Team Emirates s.t. Sam Bennett wins stage two. The race: Here's the report from stage winner & GC leader Sam Bennett's Bora-hansgrohe team. After yesterday's perfect start for BORA – hansgrohe, the team wanted to defend their leader jersey today. The second stage saw an early breakaway and again a bunch sprint, where BORA – hansgrohe sprinter Sam Bennett easily took another stage win. He expanded his lead and will wear the turquoise jersey again tomorrow during the third stage of the Tour of Turkey. 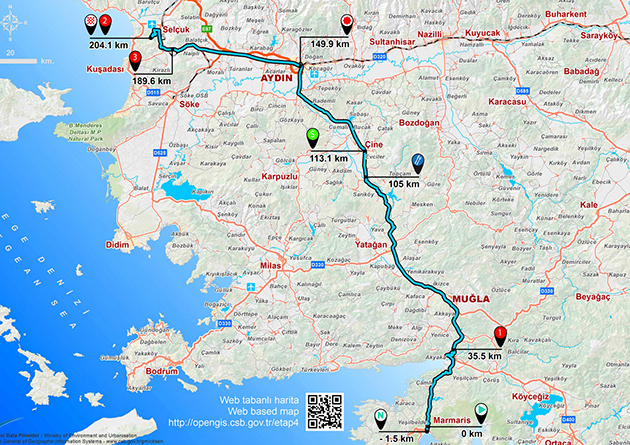 The second stage of the Tour of Turkey took the riders from Kumluca to Fethiye over 206km. This stage favoured the sprinters in the peloton with only two short climbs and again a flat finish. BORA – hansgrohe focused to defend the leader jersey of Sam Bennett. From drop of the flag the day´s breakaway formed as a trio went up the road and built an advantage of several minutes. The squad of BORA – hansgrohe with leader Sam Bennett stayed in front of the peloton and took control over the race. The breakaway was gone for most of the stage. With 40km remaining the escapees had an advantage of more than one minute, only 12 km before the finish, the peloton closed the gap and the expected bunch sprint was set up. Sam Bennett´s teammates did a stellar job to protect his lead, spent the day at the front. Especially Leo König and Michael Schwarzmann worked hard to close the gap. Like yesterday, Silvio Herklotz, Gregor Mühlberger, Alex Saramotins and Shane Archbold built the final lead out for Sam. Next to Trek-Segafredo the BORA – hansgrohe squad headed into the final kilometres, where a tough fight about the best positions started. Like yesterday, Alex and Shane put Sam in a good position. Sam was on the wheels but went out earlier today. He took the victory with a significant gap to his opponents. Sam also defended also his leader jersey and will start the third stage of the Tour of Turkey tomorrow in in the turquoise leader jersey. Leader of Tour of Turkey, Sam Bennett said after the finish, "It was another amazing team effort today. We worked well together and it paid off. Really happy with the performance and to be wearing the turquoise jersey. It's always nice to be ending the season on a high." 4 Benfatto, Marco Androni-Sidermec s.t. 5 Consonni, Simone UAE Team Emirates s.t. 6 Belletti, Manuel Wilier Triestina-Selle Italia s.t. 7 Ballerini, Davide Androni-Sidermec s.t. 8 Örken, Ahmet Turkey s.t. 9 Simion, Paolo Bardiani-CSF s.t. 11 Simón, Jordi Soul Brasil s.t. 12 Tleubayev, Ruslan Astana s.t. 13 Özgür, Batuhan Turkey s.t. 14 Pelucchi, Matteo Bora-hansgrohe s.t. 15 Barbin, Enrico Bardiani-CSF s.t. 16 Boev, Igor Gazprom-RusVelo s.t. 17 Poppel, Boy van Trek-Segafredo s.t. 18 Maronese, Marco Bardiani-CSF s.t. 19 Stassen, Julien WB Veranclassic s.t. 20 Reis, Rafael Caja Rural-Seguros RGA s.t. 21 Zeits, Andrey Astana s.t. 22 Masson, Christophe WB Veranclassic s.t. 23 Hansen, Jesper Astana s.t. 25 Herklotz, Silvio Bora-hansgrohe s.t. 26 Prades, Eduard Caja Rural-Seguros RGA s.t. 27 Stosz, Patryk CCC Sprandi Polkowice s.t. 28 Godoy, Yonder Wilier Triestina-Selle Italia s.t. 29 Ulissi, Diego UAE Team Emirates s.t. 30 Albanese, Vincenzo Bardiani-CSF s.t. 32 Akdilek, Ahmet Turkey s.t. 33 Gavazzi, Francesco Androni-Sidermec s.t. 35 Rubio, Diego Caja Rural-Seguros RGA s.t. 36 Zardini, Edoardo Bardiani-CSF s.t. 37 Beppu, Fumiyuki Trek-Segafredo s.t. 38 Bizhigitov, Zhandos Astana s.t. 39 Arslanov, Ildar Gazprom-RusVelo s.t. 40 Masnada, Fausto Androni-Sidermec s.t. 41 Ravasi, Edward UAE Team Emirates s.t. 42 Bakırcı, Nazım Turkey s.t. 43 Flórez, Miguel Wilier Triestina-Selle Italia s.t. 44 Taciak, Mateusz CCC Sprandi Polkowice s.t. 45 Mühlberger, Gregor Bora-hansgrohe s.t. 46 Celano, Danilo Caja Rural-Seguros RGA s.t. 47 Niemiec, Przemysław UAE Team Emirates s.t. 48 Atalay, Muhammed Turkey s.t. 49 Butler, Chris Caja Rural-Seguros RGA s.t. 50 Firsanov, Sergey Gazprom-RusVelo s.t. 51 Cardoso, Flávio Soul Brasil s.t. 53 Pluciński, Leszek CCC Sprandi Polkowice s.t. 55 Brutt, Pavel Gazprom-RusVelo s.t. 56 Tonelli, Alessandro Bardiani-CSF s.t. 57 Balkan, Serkan Turkey s.t. 58 Atapuma, Darwin UAE Team Emirates s.t. 60 Silva, Lincoln Soul Brasil s.t. 61 Martínez, Daniel Wilier Triestina-Selle Italia s.t. 62 Koch, Jonas CCC Sprandi Polkowice s.t. 63 Vendrame, Andrea Androni-Sidermec s.t. 64 Zurlo, Federico UAE Team Emirates s.t. 65 Lagutin, Sergey Gazprom-RusVelo s.t. 66 Pinheiro, Roberto Soul Brasil s.t. 67 Reijnen, Kiel Trek-Segafredo s.t. 68 Brożyna, Piotr CCC Sprandi Polkowice s.t. 69 Małecki, Kamil CCC Sprandi Polkowice s.t. 70 Paluta, Michał CCC Sprandi Polkowice s.t. 71 Deruette, Thomas WB Veranclassic s.t. 72 Daniel, Gregory Trek-Segafredo s.t. 73 Habeaux, Gregory WB Veranclassic s.t. 76 Şamli, Ferit Turkey s.t. 78 Coledan, Marco Trek-Segafredo s.t. 82 Saramotins, Aleksejs Bora-hansgrohe s.t. 84 Ranghetti, Victor Soul Brasil s.t. 85 Gruzdev, Dmitriy Astana s.t. 86 Balkan, Onur Turkey s.t. 87 Kump, Marko UAE Team Emirates s.t. 90 Pires, Raphael Soul Brasil s.t. 91 Spreafico, Matteo Androni-Sidermec s.t. 92 Sterbini, Simone Bardiani-CSF s.t. 94 Bertazzo, Liam Wilier Triestina-Selle Italia s.t. 97 Trusov, Nikolay Gazprom-RusVelo s.t. 100 Robeet, Ludovic WB Veranclassic s.t. 6 Albanese, Vincenzo Bardiani-CSF s.t. 8 Gavazzi, Francesco Androni-Sidermec s.t. 10 Belletti, Manuel Wilier Triestina-Selle Italia s.t. 11 Simion, Paolo Bardiani-CSF s.t. 12 Ballerini, Davide Androni-Sidermec s.t. 13 Örken, Ahmet Turkey s.t. 14 Cardoso, Flávio Soul Brasil s.t. 17 Simón, Jordi Soul Brasil s.t. 18 Barbin, Enrico Bardiani-CSF s.t. 19 Poppel, Boy van Trek-Segafredo s.t. 21 Tleubayev, Ruslan Astana s.t. 22 Maronese, Marco Bardiani-CSF s.t. 23 Sisr, František CCC Sprandi Polkowice s.t. 24 Zeits, Andrey Astana s.t. 25 Boev, Igor Gazprom-RusVelo s.t. 26 Bizhigitov, Zhandos Astana s.t. 28 Mühlberger, Gregor Bora-hansgrohe s.t. 29 Stosz, Patryk CCC Sprandi Polkowice s.t. 30 Zardini, Edoardo Bardiani-CSF s.t. 32 Ravasi, Edward UAE Team Emirates s.t. 33 Flórez, Miguel Wilier Triestina-Selle Italia s.t. 36 Beppu, Fumiyuki Trek-Segafredo s.t. 37 Reis, Rafael Caja Rural-Seguros RGA s.t. 38 Stassen, Julien WB Veranclassic s.t. 39 Balkan, Serkan Turkey s.t. 40 Arroyo, David Caja Rural-Seguros RGA s.t. 41 Masnada, Fausto Androni-Sidermec s.t. 42 Özgür, Batuhan Turkey s.t. 43 Celano, Danilo Caja Rural-Seguros RGA s.t. 44 Tonelli, Alessandro Bardiani-CSF s.t. 46 Godoy, Yonder Wilier Triestina-Selle Italia s.t. 47 Butler, Chris Caja Rural-Seguros RGA s.t. 48 Atapuma, Darwin UAE Team Emirates s.t. 49 Molina, Antonio Caja Rural-Seguros RGA s.t. 50 Hansen, Jesper Astana s.t. 51 Arslanov, Ildar Gazprom-RusVelo s.t. 52 Masson, Christophe WB Veranclassic s.t. 53 Akdilek, Ahmet Turkey s.t. 54 Rubio, Diego Caja Rural-Seguros RGA s.t. 55 Taciak, Mateusz CCC Sprandi Polkowice s.t. 56 Brutt, Pavel Gazprom-RusVelo s.t. 57 Pluciński, Leszek CCC Sprandi Polkowice s.t. 58 Laengen, Vegard UAE Team Emirates s.t. 61 Koch, Jonas CCC Sprandi Polkowice s.t. 62 Reijnen, Kiel Trek-Segafredo s.t. 63 Paluta, Michał CCC Sprandi Polkowice s.t. 64 Habeaux, Gregory WB Veranclassic s.t. 65 Silva, Lincoln Soul Brasil s.t. 66 Vendrame, Andrea Androni-Sidermec s.t. 67 Martínez, Daniel Wilier Triestina-Selle Italia s.t. 68 Koshevoy, Ilia Wilier Triestina-Selle Italia s.t. 70 Deruette, Thomas WB Veranclassic s.t. 71 Daniel, Gregory Trek-Segafredo s.t. 72 Brożyna, Piotr CCC Sprandi Polkowice s.t. 73 Małecki, Kamil CCC Sprandi Polkowice s.t. 74 Pinheiro, Roberto Soul Brasil s.t. 77 Şamli, Ferit Turkey s.t. 83 Spengler, Lukas WB Veranclassic s.t. 86 Ranghetti, Victor Soul Brasil s.t. 90 Spreafico, Matteo Androni-Sidermec s.t. 91 Pires, Raphael Soul Brasil s.t. Sam Bennett wins the first stage. The race: Here's the story from winner Sam Bennett's Bora-hansgrohe team. The 53rd edition of the Presidential Cycling Tour of Turkey commenced this Tuesday. With its flat parcours, the first stage was expected to be one for the sprinters. 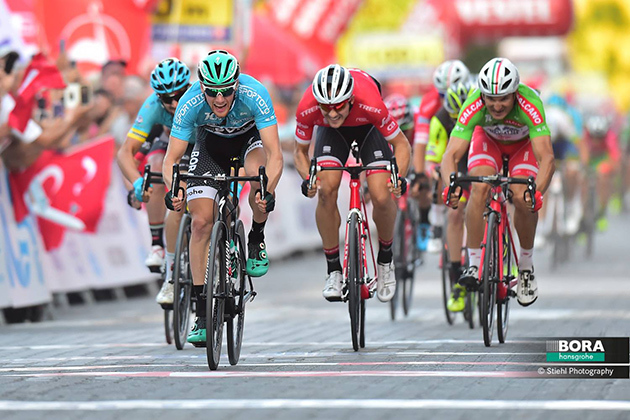 The BORA – hansgrohe sprint train put Sam Bennett, the recent winner of the Sparkassen Münsterland Giro, into a good position in the lead up to the finale, where he took out the victory, and teammate Matteo Pelucchi finished in fifth place. 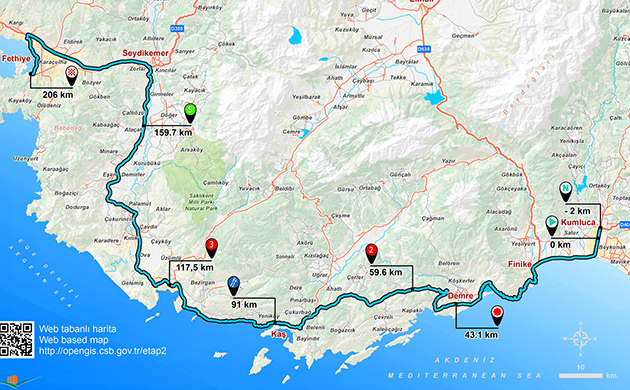 The first stage of the 53rd edition of the Tour of Turkey started from Alanya and led the riders along a 176.7km long flat course to the finish in Kemer. 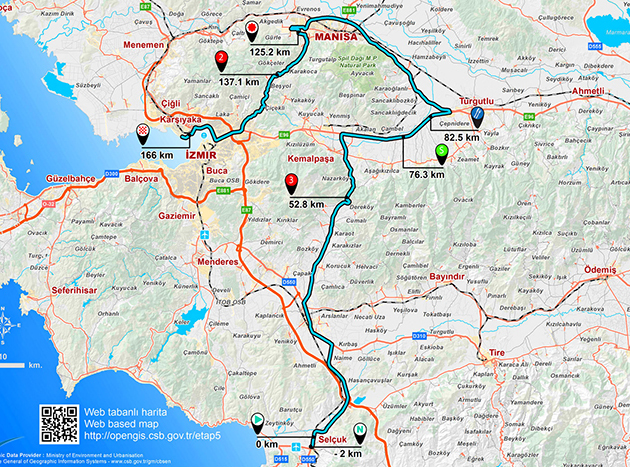 Along the route, the peloton passed through a ‘Beauties of Turkey’ sprint, which was positioned alongside important historical sites, as well as a fourth category climb, and two intermediate sprints. With the mercury reaching 20 degrees by the middle of the day, the first stage got underway, with BORA – hansgrohe focusing their efforts on Irish sprinter Sam Bennett. Straight after the official start was given, a group of six riders was able to build up an advantage of several minutes. With 58km remaining, their advantage was whittled down to one minute, with BORA – hansgrohe’s riders, most notably Michael Schwarzmann, controlling the tempo back in the main field. 35km before the finish, Trek-Segafredo increased the tempo, and the breakaway group was reeled back in. With the race being back together, the peloton headed towards the only classified climb of the day, which saw several attacks and attempts to break free of the bunch. BORA-hansgrohe showed a strong presence at the front of the field, with Leopold König and Trek-Segafredo controlling the race as it headed into the final few kilometres. The BORA – hansgrohe sprint train came to the front of the race, with Gregor Mühlberger leading the charge into Kemer, where there was a crash in the peloton. However, no BORA-hansgrohe riders were involved, and there were no serious injuries to report following the incident. The reduced peloton set a high tempo into the finishing straight, with Alex Saramotins and Shane Archbold the last remaining riders for Sam. A few metres before the finish, Sam passed through the right hand side to take an emphatic victory. His teammate Matteo Pelucchi took out fifth place. With his victory, Sam will also don the turquoise leader’s jersey. 2 Benfatto, Marco Androni-Sidermec s.t. 3 Theuns, Edward Trek-Segafredo s.t. 4 Zurlo, Federico UAE Team Emirates s.t. 5 Pelucchi, Matteo Bora-hansgrohe s.t. 7 Consonni, Simone UAE Team Emirates s.t. 8 Koch, Jonas CCC Sprandi Polkowice s.t. 10 Simón, Jordi Soul Brasil s.t. 12 Barbin, Enrico Bardiani-CSF s.t. 14 Poppel, Boy van Trek-Segafredo s.t. 15 Archbold, Shane Bora-hansgrohe s.t. 16 Ballerini, Davide Androni-Sidermec s.t. 17 Paluta, Michał CCC Sprandi Polkowice s.t. 19 Saramotins, Aleksejs Bora-hansgrohe s.t. 20 Reijnen, Kiel Trek-Segafredo s.t. 21 Mühlberger, Gregor Bora-hansgrohe s.t. 22 Coledan, Marco Trek-Segafredo s.t. 24 Habeaux, Gregory WB Veranclassic s.t. 25 Maronese, Marco Bardiani-CSF s.t. 26 Albanese, Vincenzo Bardiani-CSF s.t. 27 Ulissi, Diego UAE Team Emirates s.t. 29 Bakırcı, Nazım Turkey s.t. 30 Zeits, Andrey Astana s.t. 31 Balkan, Serkan Turkey s.t. 32 Flórez, Miguel Wilier Triestina-Selle Italia s.t. 33 Ravasi, Edward UAE Team Emirates s.t. 35 Zardini, Edoardo Bardiani-CSF s.t. 36 Maestri, Mirco Bardiani-CSF s.t. 37 Boev, Igor Gazprom-RusVelo s.t. 38 Sisr, František CCC Sprandi Polkowice s.t. 39 Chernetski, Sergei Astana s.t. 40 Frapporti, Marco Androni-Sidermec s.t. 41 Stosz, Patryk CCC Sprandi Polkowice s.t. 42 Robeet, Ludovic WB Veranclassic s.t. 43 Cecchin, Alberto Wilier Triestina-Selle Italia s.t. 44 Vendrame, Andrea Androni-Sidermec s.t. 47 Beppu, Fumiyuki Trek-Segafredo s.t. 48 Pantano, Jarlinson Trek-Segafredo s.t. 49 Spreafico, Matteo Androni-Sidermec s.t. 50 Tonelli, Alessandro Bardiani-CSF s.t. 51 Martínez, Daniel Wilier Triestina-Selle Italia s.t. 52 Deruette, Thomas WB Veranclassic s.t. 53 Atapuma, Darwin UAE Team Emirates s.t. 55 Lagutin, Sergey Gazprom-RusVelo s.t. 56 Masnada, Fausto Androni-Sidermec s.t. 57 Firsanov, Sergey Gazprom-RusVelo s.t. 58 Koshevoy, Ilia Wilier Triestina-Selle Italia s.t. 59 Bertazzo, Liam Wilier Triestina-Selle Italia s.t. 60 Balkan, Onur Turkey s.t. 61 Butler, Chris Caja Rural-Seguros RGA s.t. 62 Gavazzi, Francesco Androni-Sidermec s.t. 63 Frapporti, Mattia Androni-Sidermec s.t. 64 Pires, Raphael Soul Brasil s.t. 65 Reis, Rafael Caja Rural-Seguros RGA s.t. 66 Spengler, Lukas WB Veranclassic s.t. 67 Duquennoy, Jimmy WB Veranclassic s.t. 68 Stassen, Julien WB Veranclassic s.t. 69 Gruzdev, Dmitriy Astana s.t. 70 Daniel, Gregory Trek-Segafredo s.t. 71 Arroyo, David Caja Rural-Seguros RGA s.t. 72 Turrin, Alex Wilier Triestina-Selle Italia s.t. 74 Ranghetti, Victor Soul Brasil s.t. 75 Prades, Eduard Caja Rural-Seguros RGA s.t. 76 Stalnov, Nikita Astana s.t. 77 Arslanov, Ildar Gazprom-RusVelo s.t. 78 Atalay, Muhammed Turkey s.t. 79 Molina, Antonio Caja Rural-Seguros RGA s.t. 80 Rovny, Ivan Gazprom-RusVelo s.t. 81 Brutt, Pavel Gazprom-RusVelo s.t. 84 Örken, Ahmet Turkey s.t. 86 Alafaci, Eugenio Trek-Segafredo s.t. 88 Brożyna, Piotr CCC Sprandi Polkowice s.t. 89 Pluciński, Leszek CCC Sprandi Polkowice s.t. 90 Taciak, Mateusz CCC Sprandi Polkowice s.t. 91 Hansen, Jesper Astana s.t. 92 Akdilek, Ahmet Turkey s.t. 95 Kump, Marko UAE Team Emirates s.t. 96 Masson, Christophe WB Veranclassic s.t. 97 Małecki, Kamil CCC Sprandi Polkowice s.t. 98 Porsev, Alexander Gazprom-RusVelo s.t. 99 Rubio, Diego Caja Rural-Seguros RGA s.t. 100 Affonso, Murilo Soul Brasil s.t. 101 Cardoso, Flávio Soul Brasil s.t. 102 Pinheiro, Roberto Soul Brasil s.t. 5 Gavazzi, Francesco Androni-Sidermec s.t. 7 Cardoso, Flávio Soul Brasil s.t. 9 Atalay, Muhammed Turkey s.t. 11 Pelucchi, Matteo Bora-hansgrohe s.t. 12 Minali, Riccardo Astana s.t. 13 Consonni, Simone UAE Team Emirates s.t. 14 Koch, Jonas CCC Sprandi Polkowice s.t. 15 Belletti, Manuel Wilier Triestina-Selle Italia s.t. 17 Simion, Paolo Bardiani-CSF s.t. 19 Trusov, Nikolay Gazprom-RusVelo s.t. 20 Poppel, Boy van Trek-Segafredo s.t. 21 Archbold, Shane Bora-hansgrohe s.t. 22 Ballerini, Davide Androni-Sidermec s.t. 23 Paluta, Michał CCC Sprandi Polkowice s.t. 24 Bizhigitov, Zhandos Astana s.t. 25 Saramotins, Aleksejs Bora-hansgrohe s.t. 26 Reijnen, Kiel Trek-Segafredo s.t. 27 Mühlberger, Gregor Bora-hansgrohe s.t. 28 Coledan, Marco Trek-Segafredo s.t. 29 Tleubayev, Ruslan Astana s.t. 30 Habeaux, Gregory WB Veranclassic s.t. 31 Maronese, Marco Bardiani-CSF s.t. 32 Niemiec, Przemysław UAE Team Emirates s.t. 33 Bakırcı, Nazım Turkey s.t. 35 Balkan, Serkan Turkey s.t. 36 Flórez, Miguel Wilier Triestina-Selle Italia s.t. 37 Ravasi, Edward UAE Team Emirates s.t. 38 Herklotz, Silvio Bora-hansgrohe s.t. 39 Zardini, Edoardo Bardiani-CSF s.t. 40 Maestri, Mirco Bardiani-CSF s.t. 41 Boev, Igor Gazprom-RusVelo s.t. 43 Chernetski, Sergei Astana s.t. 44 Frapporti, Marco Androni-Sidermec s.t. 45 Stosz, Patryk CCC Sprandi Polkowice s.t. 46 Robeet, Ludovic WB Veranclassic s.t. 47 Cecchin, Alberto Wilier Triestina-Selle Italia s.t. 48 Vendrame, Andrea Androni-Sidermec s.t. 49 Silva, Lincoln Soul Brasil s.t. 50 Beppu, Fumiyuki Trek-Segafredo s.t. 51 Pantano, Jarlinson Trek-Segafredo s.t. 52 Spreafico, Matteo Androni-Sidermec s.t. 53 Tonelli, Alessandro Bardiani-CSF s.t. 54 Martínez, Daniel Wilier Triestina-Selle Italia s.t. 55 Deruette, Thomas WB Veranclassic s.t. 56 Atapuma, Darwin UAE Team Emirates s.t. 57 Celano, Danilo Caja Rural-Seguros RGA s.t. 58 Lagutin, Sergey Gazprom-RusVelo s.t. 59 Masnada, Fausto Androni-Sidermec s.t. 60 Firsanov, Sergey Gazprom-RusVelo s.t. 61 Koshevoy, Ilia Wilier Triestina-Selle Italia s.t. 62 Bertazzo, Liam Wilier Triestina-Selle Italia s.t. 64 Butler, Chris Caja Rural-Seguros RGA s.t. 65 Frapporti, Mattia Androni-Sidermec s.t. 66 Pires, Raphael Soul Brasil s.t. 67 Reis, Rafael Caja Rural-Seguros RGA s.t. 68 Spengler, Lukas WB Veranclassic s.t. 69 Duquennoy, Jimmy WB Veranclassic s.t. 70 Stassen, Julien WB Veranclassic s.t. 71 Gruzdev, Dmitriy Astana s.t. 73 Arroyo, David Caja Rural-Seguros RGA s.t. 74 Sterbini, Simone Bardiani-CSF s.t. 75 Ranghetti, Victor Soul Brasil s.t. 76 Prades, Eduard Caja Rural-Seguros RGA s.t. 77 Stalnov, Nikita Astana s.t. 78 Arslanov, Ildar Gazprom-RusVelo s.t. 82 Şamli, Ferit Turkey s.t. 83 Örken, Ahmet Turkey s.t. 84 Özgür, Batuhan Turkey s.t. 85 Brożyna, Piotr CCC Sprandi Polkowice s.t. 86 Pluciński, Leszek CCC Sprandi Polkowice s.t. 87 Taciak, Mateusz CCC Sprandi Polkowice s.t. 88 Hansen, Jesper Astana s.t. 89 Akdilek, Ahmet Turkey s.t. 90 Laengen, Vegard UAE Team Emirates s.t. 91 Kump, Marko UAE Team Emirates s.t. 92 Masson, Christophe WB Veranclassic s.t. 93 Małecki, Kamil CCC Sprandi Polkowice s.t. 94 Porsev, Alexander Gazprom-RusVelo s.t. 95 Rubio, Diego Caja Rural-Seguros RGA s.t. 96 Affonso, Murilo Soul Brasil s.t. 97 Pinheiro, Roberto Soul Brasil s.t. 101 Alafaci, Eugenio Trek-Segafredo s.t.